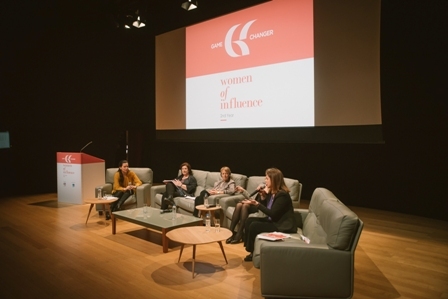 The Game Changer in Women of Influence conference, successfully held at the Onassis Cultural Centre on Monday 5 February, by 24MEDIA in collaboration with the strategic communications company “Symeon G. Tsomokos”, was sold out for a second consecutive year. The conference was attended by more than 300 representatives of the business world and specialized executives of the sector. Following last year’s success, this year’s conference attempted to highlight the advantages of female participation in the economy and in society whilst contributing to a change in the mentality that hinders women’s access to highly influential and prestigious positions. Elena Papadopoulou, Chief Officer of Human Resources for the ΟΤΕ Group, spoke about gender-based discrimination in the job market, noting that it is women themselves who take steps backwards. Manolis Theodorakis, HR Director Greece & Balkans for Toyota Hellas focused on how technological advancement will help women in the job market. Fotini Kouvela, Secretary General for Gender Equality, presented the figures for female unemployment which remain at 25%, even though the gap between men and women has closed over recent years. Elena Fornaro CEO της ALES GROUPE Hellas, spoke of the equality framework which is not only institutional, but created by companies themselves. A very interesting survey was presented by Michalis Masourakis, Chief Economist of the Hellenic Federation of Enterprises, regarding the equality between men and women in the job market, noting the low percentage of female participation in politics, whilst Charlotte Sammelin, Swedish Ambassador to Greece, spoke of Sweden’s outstanding gender equality policy. The conference was held with the support of Lierac and Athens Tech College and under the auspice of the General Secretariat for Gender Equality and the Hellenic Swedish Chamber of Commerce. Media sponsors for the conference were Direction Business Network with Business Today, AdBusiness, advertising.gr, businessnews.gr, as well as Huffpost Greece and Ladylike.gr.